Here is the surprising answer to this much misunderstood problem! THIS subject is vital! Some brethren assume because they are not overcoming, they have not been called. Unless we can know — UNLESS ALL DOUBTS ARE REMOVED — we have no assurance of withstanding the trials certain to come in this generation. All really converted Christians receive a Divine call! This is one of the plainest truths of the Bible, yet millions assume it is a matter of their own "choice." Notice what Jesus told His disciples: "Because IT IS GIVEN unto YOU to know the mysteries of the kingdom of heaven, BUT TO THEM [the vast majority] IT IS NOT GIVEN... Therefore speak I to them in parables [to obscure the truth]... LEST at any time they should see with their eyes, and hear with their ears, and should UNDERSTAND with their heart, and SHOULD BE CONVERTED..." (Mat. 13:11-15). Jesus here revealed that only a tiny minority [a small number of disciples] were being given real Bible understanding. Jesus said it simply is not God's intention to convert everyone at this time! Notice further; "No man can come to me, except the Father which has sent me draw him..." (John 6:44). And again: "No man can come to me, except it were given unto him of my Father..." (verse 65). The apostle Paul said the same thing. Notice it. "For ye see your calling brethren, how that NOT MANY wise men after the flesh, NOT MANY mighty, NOT MANY noble, are called" (I Cor. 1:26). These are only a few of many Bible examples. But these make it plain to see that ONLY A MINORITY are being converted during the present age. No wonder humanity, as a whole, feels no real need for God. Men believe themselves to be self-sufficient. They fail to recognize Bible truths! They fail to realize what is really wrong with this world, how spiritually blinded professing Christianity is, and, by contrast, just how great and glorious God is. Understanding these things IS THE RESULT OF BEING CALLED! True Christians — those who see things as they REALLY are — receive a DIVINE CALL! The most difficult thing for any human being is to admit error, and then to change. The mind excuses misdeeds, justifies itself, seeks a "way out." One of the most dangerous avenues anyone can take is the attempt to "get around" God's truth with the excuse that "since I'm not converted, then I have not been called." This deceptive disregarding of responsibility is an attempt to disobey God by PRETENDING to be a bystander! What is wrong with this reasoning? Just this! The call in itself doesn't convert anyone! CONVERSION IS THE RESULT OF HEEDING THE CALL! Lack of conversion does not mean you have not been called. Every human being is altogether carnal and rebellious until CONVERSION takes place. God CALLS us while we are yet unconverted — while we are still rebelling! Conversion is a changing process, our becoming more like God. Unless we heed the call and decide to change our way of life, the call of itself has no power to convert — THE CALL MERELY REVEALS WHAT WE MUST DO IN ORDER TO BE CONVERTED! The natural or fleshly mind we are born with is automatically contrary to God's law (Rom. 8:7). ALL have sinned and come short of the glory of God" (Rom. 3:23). Since we have all been a part of this world, a DIVINE CALL is necessary to reveal our NEED to repent and come out of the world. Whether or not CONVERSION takes place as a result of that call is OUR RESPONSIBILITY! Jesus stated that he had come to call the sinners, not the righteous (that is, the "self-righteous") to repentance (Mat. 9:13). Repentance — with belief and baptism — is the first step we must take in heeding the call. Then, through the power of God's Spirit, we begin the struggle against the downpull of human nature. We must — by the supernatural power of God's Spirit — master ourselves. We must overcome society and the influence of the Devil. We must put off the "old man" and put on the new until, at the resurrection, we become completely converted. So the call itself doesn't convert anybody! Conversion results from HEEDING the call. Notice how this is illustrated in II Tim. 4:10. Demas had the knowledge of God's truth. He knew and worked with Paul personally. But this was not enough! He did not remain steadfast! HE HAD NOT MADE HIS CALLING SURE! Peter warns us to give diligence "to make our calling SURE" (II Pet. 1:10). If the calling of itself meant we are automatically converted, Peter would not have written this warning. We make our calling sure by YIELDING TOTALLY to God. Once God decides to call an individual, He will not change His mind (Rom. 11:29). We each receive only one opportunity for salvation. If God calls us during this age, we are having our one and only opportunity. Let us not excuse ourselves by PRETENDING WE HAVEN'T BEEN CALLED when we do understand the truth! We must yield ourselves to God, contrary to what we naturally prefer to do. Many misunderstand how God calls. Some feel God calls by means of an audible voice. Others feel it is done by drastic intervention such as accidents or fires. Still others — emotionally inclined — desire a "good feeling all over" to be assured of a calling. What is the truth? How does God call? Amazingly enough, the answer is very simple. No lengthy theological exposition is necessary — such would only complicate the clear, understandable scriptures on the subject. Turn to II Thes. 2:13. "But we are bound to give thanks always to God for you brethren beloved of the Lord, because God hath from the beginning CHOSEN you to salvation through SANCTIFICATION OF THE SPIRIT and BELIEF OF THE TRUTH." MANY are being CALLED — but few chosen! 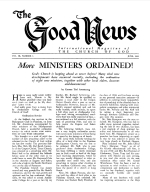 Jesus Christ orally CALLS many individuals hearing the World Tomorrow program, or who read the PLAIN TRUTH magazine. Perhaps some will be called through YOUR personal example, or witness. In each case, it is the Holy Spirit doing the calling, THROUGH HUMAN INSTRUMENTS! REMEMBER THE PARABLE OF THE SOWER. MANY will BEGIN to receive the Word — but, through selfish interest, persecution, or just plain spiritual lethargy, will REJECT THE CALL! They have not been CHOSEN to spiritually understand the truth. They only carnally saw some points of truth. Think of it! Evangelists shout, "GIVE YOUR HEART TO THE LORD!" People hear the piteous plea — "Won't you come?" And yet — the inspired Word of God reveals, they CANNOT UNLESS THE FATHER SPECIFICALLY DRAWS THEM! (John 6:44). Jesus sternly warned there will be MANY who will SEEK, to enter in, and WILL NOT BE ABLE! It is only those who have been called, and to whom the Father has CHOSEN to REVEAL Himself, who can be truly converted. Paul was inspired to write, "But as it is written, 'Eye hath not seen, nor ear heard, neither have entered into the heart of man, the things which God hath prepared for them that love Him.' But God hath REVEALED them unto us BY HIS SPIRIT" (I Cor. 2:9-10). Notice — many might WANT to understand — but it must be specifically GIVEN them of God's Spirit!" for the Spirit searcheth all things, yea, the DEEP things of God. "For what man knoweth the things of a man, save the spirit of man which is in him? even so the things of God knoweth no man, but the Spirit of God." "Now we have received, not the spirit of the world but the spirit which is of God; THAT WE MIGHT KNOW the things that are FREELY GIVEN to us of God!" What Is "Sanctification of the Spirit"? God has not merely called, but also chosen you to salvation through SANCTIFICATION [setting apart] OF THE SPIRIT. Here is how God works out the first step in bringing each individual to a full knowledge of salvation. He sanctifies — or sets each one apart — by means of the Holy Spirit! Jesus told Peter that the Spirit of the Father revealed to him that Jesus is Christ the Son of God (Mat. 16:17). Here is the supernatural power of God working on the minds of men, revealing truth to them, PRIOR TO CONVERSION. Jesus further illustrated this when He instructed His disciples that they would later (on the day of Pentecost) have the Spirit dwelling IN them, but at that present time (prior to His ascension to heaven) the Spirit was WITH them (John 14:17). It is the Spirit of God which reveals truth — which sanctifies or sets apart an individual to make him an heir of salvation. Now back to the latter portion of II Thes. 2:13. Notice that "... BELIEF OF THE TRUTH" is the second feature of this divine call. The Spirit of God leads us to the truth, but we must BELIEVE that truth! Jesus said, "... thy word is truth" (John 17:17); The truth is the inspired Word of God — the Holy Bible! God calls us by leading our minds, by means of His Spirit, to believe the Holy Bible! But spiritual truth cannot be understood or believed without the influence of the Spirit of God (I Cor. 2:14). Turn to Acts 13:44. "And the next Sabbath day came almost the whole city together to hear THE WORD OF GOD." And verse 48: "And when the Gentiles heard this, they were glad and glorified THE WORD OF THE LORD: and as many as were ORDAINED [called] to eternal life BELIEVED." What did they believe? The Word of God — the Holy Scriptures! Those called to salvation believed God's Word! THERE WAS NO DOUBT IN THEIR MINDS! They knew the Scriptures meant exactly what they said! They BELIEVED the Word of God which Jesus said is truth. Their calling resulted from being set aside — sanctified — by God's Spirit and their BELIEVING THE TRUTH! There are many reasons today why men do not believe the truth — why the vast majority of professing Christians do not understand the Bible! Though God has allowed mankind to be deceived, yet He has given of His Spirit to a CALLED FEW so that we can understand the purpose of life. It is God's Spirit that enables us to comprehend the basic principles of understanding. Consider these principles. They manifest the Spirit of God working upon and through the human mind. First of all, Jesus said, "MAN SHALL NOT LIVE BY BREAD alone but by every word that proceedeth out of the mouth of GOD" (Matt. 4:4). Here is the first principle. To really understand the Bible it is necessary to LIVE BY EVERY WORD OF GOD, not just some portions or pet doctrines. Most churches accept a few Bible truths but for the most part walk in dismal error. This is because they are not willing to LIVE by every word of God. They deliberately reject all but a relatively SMALL portion which has no bearing on their personal lives. God gives understanding only to those who are willing to live by ALL of His word! "ALL SCRIPTURE IS GIVEN BY INSPIRATION OF GOD, and is profitable for doctrine, for reproof, for correction, for instruction in righteousness" (II Tim. 3:16). How can anyone really believe the Bible if he feels portions are uninspired? Yet this is exactly what many "Christians," so-called, believe today! Some regard the Old Testament purely as historical literature. Some teach Revelation to be the writings of a man obsessed with hallucinations. Others say only the epistles of Paul should be accepted. What nonsense! All this doctrinal confusion is a direct result of choosing certain portions of the Bible to believe — refusing to accept all scripture as given by inspiration of God. "TO THE LAW AND TO THE TESTIMONY: if they speak not according to this word, it is because there is no light in them" (Isa. 8:20). The significant feature of the Bible from Genesis to Revelation is LAW. Yet, how men disregard and try to do away with God's law! Every conceivable argument has been advanced in an attempt to do away with the ten commandments, the very theme of the entire Bible. It is small wonder men cannot understand God's Word when every reference to His law is distorted, twisted, perverted, and maligned. Disobedience to God is the keynote in today's world. But Isaiah said under inspiration that if men do not teach in accordance with God's law and the testimony (all of God's word) it is because there is no light in them! "... THE SCRIPTURE CANNOT BE BROKEN" (John 10:35). Jesus said the scriptures make a complete chain — they do not contradict one another, yet books have been written to expose assumed Bible contradictions. But Jesus said Scripture does not contradict itself! Every supposed contradiction is the result of either a mistranslation or a misinterpretation. Unless you approach the scriptures with this truth, you cannot hope to grasp the full meaning of God's word. You will fool yourself into believing the Bible is full of contradictions and cannot be depended upon. "... NO PROPHECY OF THE SCRIPTURE IS OF ANY PRIVATE INTERPRETATION" (II Pet. 1:20). Many cannot understand scripture simply because they have not learned the Bible interprets itself! Many supposed contradictions occur because men have not learned to let the Bible interpret itself. Through diligent and earnest study, we can understand perplexing verses only in the light of other scriptures. These simple principles serve as guides in enabling us to believe the truth. Because educational theories of men have been substituted in place of these rules, men fail utterly to comprehend the means God utilizes to call us to His truth. These principles are not discernible to the carnal mind uninfluenced by God's Spirit. As a result of sanctification of the Spirit and belief of the truth "... HE CALLED YOU BY OUR GOSPEL..." (II Thes. 2:14). Now that the mind has been properly conditioned, the active means God uses to call us is the gospel message! Men do not grasp the gospel message because they have not received the vital principles of understanding which make the truth clear. As a result of your believing the Bible to mean exactly what it says, the gospel message is perceived to be God's personal message to you. Here is how God called you! Absolutely no one can be called unless and until he hears the true gospel. The gospel is not alone a message about Christ's person, but the message of God's government soon to be established on this earth — a government made up of the very Family of God that will rule all nations with a rod of iron, that will restore world peace, that will bring untold blessings, happiness, and joy everlasting through the All-Wise and Loving God. God is calling some now to assist Him in ruling the world. What a wonderful message! What a wonderful calling! The time of universal deception is to cease. Men will no longer listen to counterfeit gospels which misrepresent the truth. Let us reiterate! Conversion is the RESULT of heeding the call! Refusing to obey, or being incapable of obeying does not mean you haven't been called. It means your condition is the same as all human beings when they are first called. You must surrender your will to God, repent, and be baptized in order to receive the divine, supernatural power to obey. IF YOU RECEIVE AND UNDERSTAND THE TRUE GOSPEL, IF YOU UNDERSTAND GOD'S WORD TO MEAN EXACTLY WHAT IT SAYS, YOU HAVE BEEN CALLED! You will feel convicted of your sins. This conviction leads to repentance and baptism, the assurance you have HEEDED the call. Conversion brings joys never before realized. Mastery over human nature, lusts, and passions is evident. The power of God affects definite changes in attitude and outlook on life. Happiness and peace of mind are experienced even in the midst of problems, troubles, and persecutions. There is a special love for the converted brethren as well as an increase in love toward all men in general. More patience on the job and with your family develops. Prayers are answered. God's power is manifested more and more in your life. You won't be perfect — much overcoming is yet necessary — but you will be thanking and praising God for what He is doing in your life. If you have heeded the call, conversion is taking place and must continue to do so unto the very end. Brethren, a deep-seated MISUNDERSTANDING of these viral principles has been evidenced by some. One or two, wishing to justify themselves in their own carnal-minded rebellion have "convinced" themselves they weren't truly CONVERTED, and, hence, ARE NOT YET HELD ACCOUNTABLE and RESPONSIBLE for their present sins! They have "reasoned themselves astray," "kidding" themselves God will CALL THEM AGAIN AT SOME FUTURE TIME! THIS IS A DEADLY ERROR! If you have progressed so far in God's Church you're now READING THIS ARTICLE — MAKE NO MISTAKE ABOUT IT, YOU HAVE RECEIVED YOUR ONE, YOUR ONLY CALL! God holds us accountable according to knowledge. Some have turned from God on the pretense they had not been called. Yet this acknowledgment indicates they WERE CALLED BUT REFUSED TO HEED! Christ said to whom much is given of him shall much be required (Luke 12:48). Peter said if we turn back to this world after having escaped its pollutions, the latter end will be worse than the beginning. God has given us a priceless calling. We must not "kid" ourselves into thinking we are not accountable because of not being converted. Jesus Christ told the Pharisees that some of them were accountable because they KNEW the truth but refused to obey it (John 9:41). The lack of strength or desire to obey, unanswered prayer, and weakness in overcoming are not sufficient to prove we have not been called. Rather, they indicate we are not heeding the call. Brethren, let us give diligence to make our calling sure!